Not many things in life are free. And even fewer things in high performance driving are free. So, it was a huge surprise when our fantastic two-year old track High Plains Raceway offered two free lapping days between Christmas and New Years. These days were weather dependent and the weather cooperated in spades. The mercury nudged 50 and as you can see in the pictures, it was a clear Colorado day. 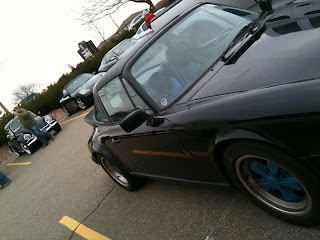 I went to the track with my neighbor who swapped his 78 SC for the 92 500E. One Porsche for another part-Porsche. On track, the 500E impressed most on the straights, massive torque pushing you easily into triple digits on High Plain's back straight. The heavy-handed traction control did take some of the fun out of the twisties, but the car still was so flat and poised for a eighteen-year old super sedan. My SC was a ton of fun. It was the first time I had it on track. Engine wise it is stock except for SSIs and a 2 in 2 out muffler and cat delete. The suspension though is track oriented with 22/28 weltmeisters, Bilsteins and Tarett sway bars. It had a very neutral, composed feeling. What a ton of fun. As it is my DD, I kept the revs under 5500. So, this cut my track time drought from five months to two and a half. And that is reason enough to give thanks. I am super thankful to my neighbor who made this great stocking for my son, Graham. Check it out, it is even an impact bumper model. Love it. 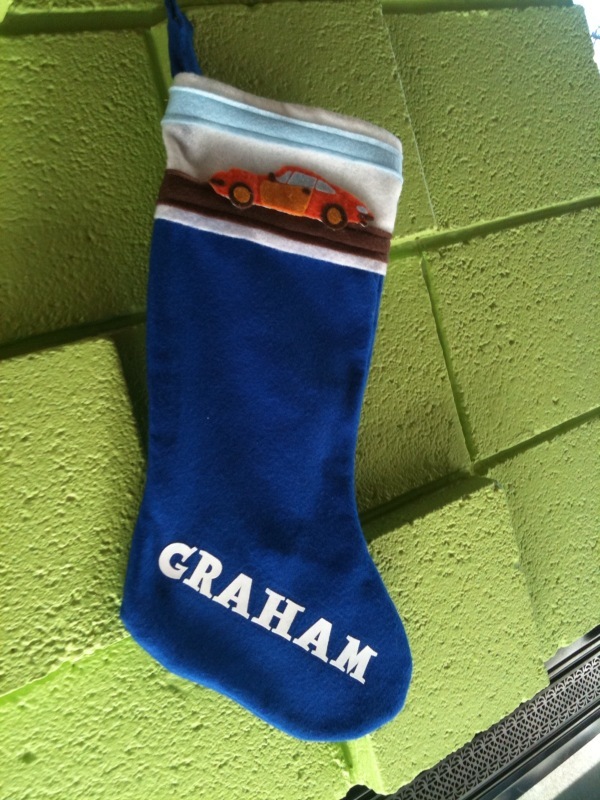 The only thing better than a Porsche on a stocking, would be a Porsche key in a stocking. But I think he will have to wait another fifteen years for that. And, after my not so great experiences with Porsche Design products, I am glad to have something handcrafted right next door. Steve McQueen has certainly gotten his fair share of coverage in the automotive press recently. Too much, some might say. And Bullitt is certainly a movie that has spawned a bunch of replicas, including a very lame Mustang. So now to the above pictured item. I do love a clever graphic T-shirt. Heck, working in an ad agency, I am surrounded by dudes wearing them. 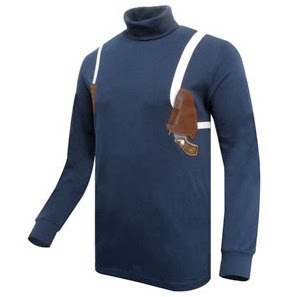 So, when I saw this rollneck that was a new item on grandprixlegends.com I just had to share. It is just so clever. A cotton shirt screen printed front and back with a holster. More costume than casual wear to be sure, but it would be fun to wear into a meeting with a blazer over it and just let the graphic peek out. (grandprixlegends also offers a Bullitt replica blazer). Note, KERF has discontinued DIY option. My wife Nicolette and I are fortunate enough to live in Arapahoe Acres in Englewood, CO, one of the most complete mid-century modern neighborhoods in America. The exterior of almost every one of the homes remains close to original. Unfortunately, previous owners had removed almost all of the original fittings inside our home. 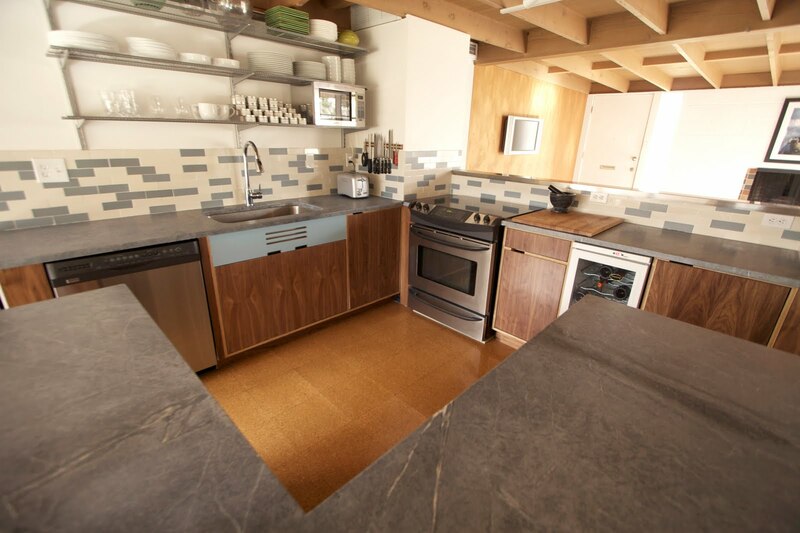 Only the concrete block walls and exposed beam ceiling were spared the renovators’ removal. Every bit of custom cabinetry, every piece that might have showed the craftsman’s hand had been ditched in the 1970s. We try to put back as much handcrafted, custom fitted pieces as possible. I’ve recreated pockmarked mahogany walls and rebuilt grass cloth closet doors. 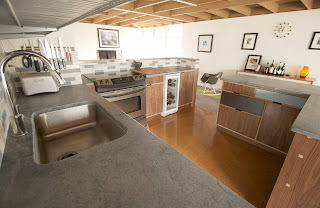 But the kitchen, one of the largest opportunities to reinstall custom era-appropriate work was presenting a conundrum. Pure custom cabinetry was out of our budget. That is if the builders even understood the non-Farmhouse style we were after. And the semi-custom cabinets from IKEA and other manufactures were too limited in their palette and customization. They also have too much of the machine about them. They are too slick. All the mechanics of how they are built are hidden. 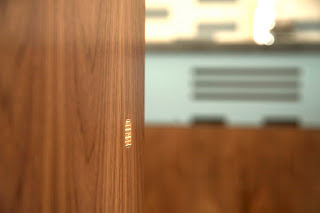 We wanted a cabinet that was proud of its construction and humble of material. Like an Eames lounge with exposed shock cushions. Or an aluminum Emeco chair with hand-finished welds. Or even the original cabinets that the house came with, simply built of mahogany. We also wanted to be part of a design team. Not just customers picking off a prêt-a-porter rack. As an advertising professional, I know that a small talented team usually creates stronger work than one talented individual. It is the sharing and multiplying, and ultimately reducing, of ideas that forges strong, vetted ideas. The key is a small, focused team. Too large and the ideas just get watered down and meander towards the middle of the road. I was sure the same philosophy could be applied to furniture and cabinetry if I could find a willing partner to work with our budget of $6,000. We found this partner in Kerf design. 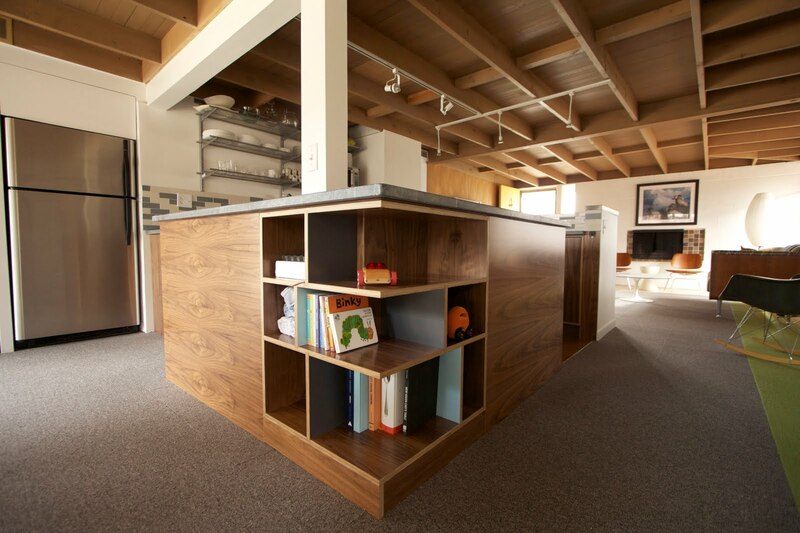 Kerf produces custom plywood cabinets with exposed, get it, kerfs. Their designs also exclude hardware and allow the cabinets to function without a shiny bauble hanging off the front. Pure. Rational. Solid. From the moment you call Kerf, you are speaking with people who will be intimately involved in the design and building of your cabinets. You toss out ideas. They bat them back with some of their own. They push you to think about your space in new ways. Not to be forgotten is the sample kit that Kerf sends customers so you can pick laminate and wood colors, it is a work of art itself. One of the most enjoyable parts of the process is the rendering that Kerf creates of your project, 3-D pictures that can help you imagine walking around your new cabinets. Able to make tweaks to the design at this stage was key in working to craft a cohesive look. For example, we had a large rounded edge on the bookshelf portion of our island replaced with a right angle to better match the hard edges in the rest of our home. 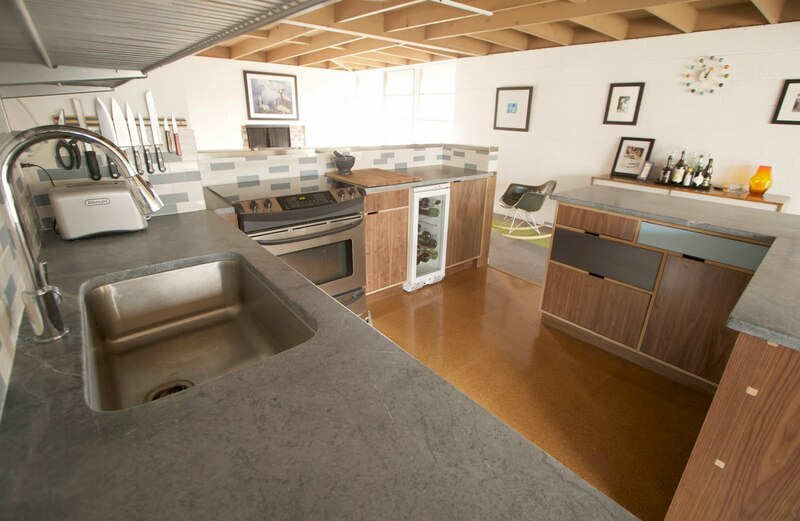 Once your design is set, you can choose to have the cabinets fully assembled and shipped to your home. Or, sent out as a knocked-down kit. We opted for the latter as it saves money on shipping and raw costs. It also allows you to be a larger part of the project because as anyone knows, installing cabinets takes a lot of time and effort to set straight and true. Over the course of four weekends I was able to assemble and install our cabinets. 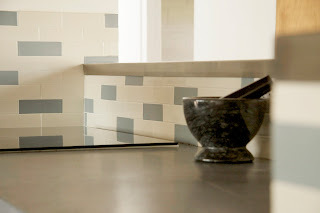 The soapstone countertops and Heath tiles took another six weeks. There is no doubt with this process, you are not just ‘hanging boxes’, you are an integral part of building your cabinetry. You shave a bit here, wedge a bit there. Glue. Screw. Set. It is really rewarding to watch it all come together. And even more rewarding to be installing work that is built in the mid-century ethos. I didn’t have the opportunity sixty years ago to work with Edward Hawkins, the original designer of our home, but I was able to work with equally talented designers. Equally committed modern designers to put something in my home that I, and I am sure, subsequent owners would be proud of. Affordable, custom companies for cabinets, furniture, landscaping and more are out there. For your next project, find one. You and your house will benefit from the process. I took my first trip to Wisconsin this year. A business trip. But luckily we make a lot of fun on our trips. Including hitting the local dining scene, high and low, and checking out great places to drink beer. Including, Koz’s Mini Bowl, a remarkable bar where you can bowl on a twenty foot lane while children set the pins at midnight. It’s like partying in your weird Aunt’s basement. But Wisconsin really struck me with how beautiful it was. And with how seriously they take their cured meats and hearty cheeses. Like this is a surprise coming from a place where the baseball team is named after beer makers? It is well known that Wisconsinites like to drink beer. And oddly enough, Brandy Old Fashioneds. But what is not all that well known is that Kenosha, Wisconsin was the home of an automotive brand for the first half and then some of the past century. There, the Nash automobiles were cranked out in impressive enough quantities. 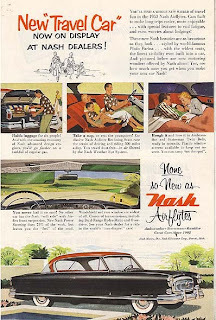 Nash was not that trail blazing until 1949-1954 when they introduced the Airfltye series of cars. Commonly known as the bathtub cars, as they look like an inverted bathtub. 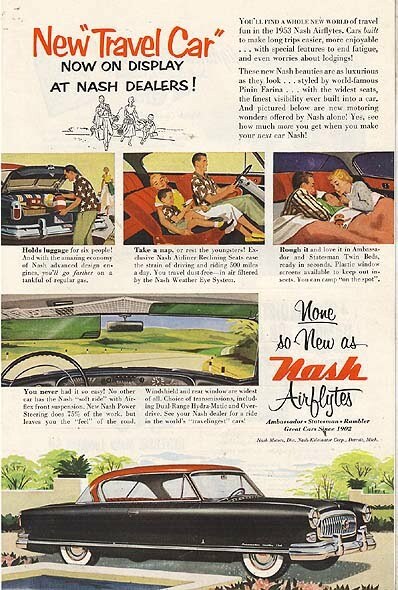 More of interest to me as an ad man is that Nash knew they could not be everything to everyone. So they carved out a rather unique niche. Or market positioning we would say today. And that was the idea that Nash was the ‘Travelingest Car’. And this wasn’t just copy. The product backed it up. Good gas mileage. Innovative heating and cooling systems that benefited from technology developed by the owners other business, the Kelvinator Corporation. Add in fold-flat seats that transformed into beds and optional screens for the windows and you had an art deco tent on wheels. Stick that in your pipe and smoke it, Pontiac Aztec. So, the car would be a 1952 Nash Airflyte four-door sedan. The food would all be local Wisconsin food. No need to go outside the state borders. For drink, I would have to include the Champagne of beers, Miller High Life. It’s sensuous clear glass bottle and girl in the moon logo perfect beer iconography. And its taste delivers too for a regular beer, good malt and low carbonation. Of course, man cannot live on a beer alone so I would have to gather a cache of the wondrous Bloody Marys that they mix up at Sobelman’s. The spicy mix I could get filled in a thermos, but that is just half the charm of a Sobelman Bloody. You need the fixings. And fixings they are. So many that they come on a skewer on a separate plate. It’s like an entire cruise ship buffet has been pierced on a wooden rod and been expected to fit onto a salad plate. Generosity is a hallmark of the Badger state. For food. It is cheese and meat. Meat and cheese. A picnic is no place for the other Wisconsin delight, the fish fry. Pick up a loaf or two of rye from Peter Sciortino. Then go to any number of small butchers to stock up on summer sausage, Trega cheddar, Hidden Springs Creamery Honey Lavendar sheep’s milk cheese. 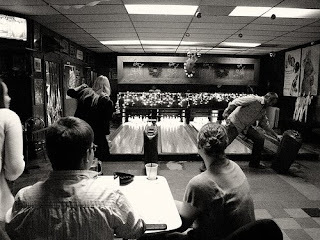 Skip the Usinger’s. The award-winning cured products from Nolechek’s or Wenzel Farms are also worth provisioning. And where to drive? To the coast. Preferably to the north. The farther you can go the better. Enjoy the lazy steering of the Nash. Hold your hand out the window and move it up and down feeling the thick, humid air. Pull off somewhere unmarked and tuck in. And relax, knowing if you need to take a nap to sleep off the Miller and Bloody’s the Nash is up to task of providing a comfy bed. 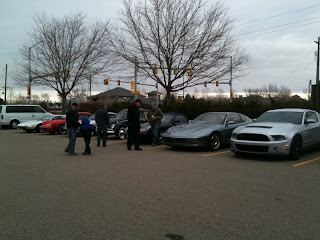 As my son gets up at 6:15am, making it up to Cars & Coffee in the Boulder area is no problem. This time, just me and little man headed up. So, the first thing I needed to do was put the Recaro child seat in the SC. This takes but a moment. Man, am I jealous of this seat. It has side-impact protection. Cool two-tone fabric. Halo head rest. It's better than my OMP race seat. Spoiled. You can see it in the picture of my black Targa. Kinda nice that the blue matches my blue wheels. A couple of the more interesting cars that came out in the overcast 35 degree weather were a Bitter 3.9. Opel based, this one had BMW wheels and a bad window tint that precluded a good look at the interior. 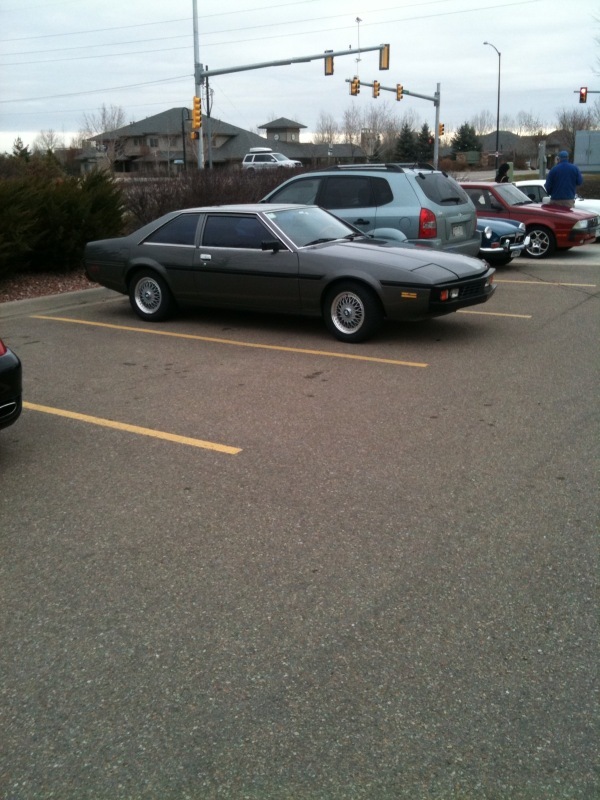 I did catch a glimpse of some Maserati Bi-turbo type seats though. 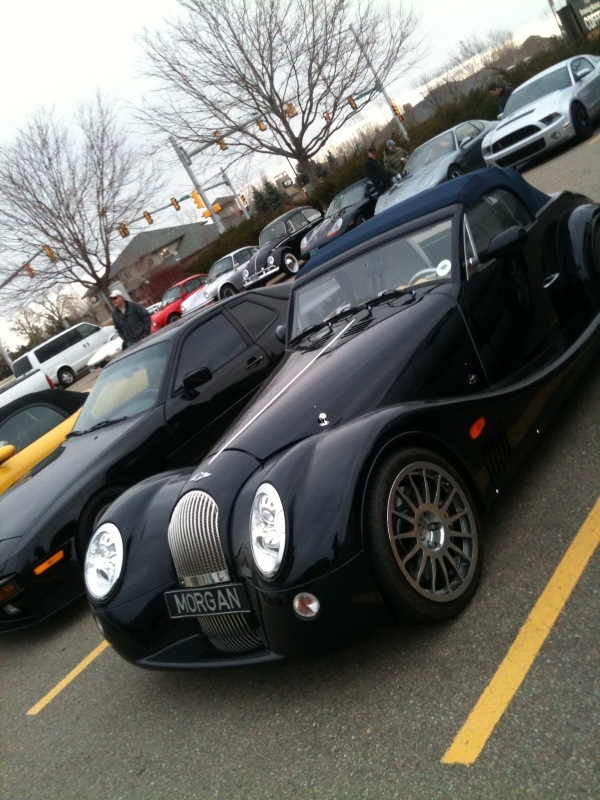 A Morgan Aero showed out. I like these. I do not get the regular Morgans. But the new aeros are very nice looking. And powerful. And some of the new Morgans I've seen reported about in Octane are utterly beautiful. Also in the pics is a row of cars including a classy Ferrari 456 (I think) and an elemental black and white VW. All in all, a great way to spend a couple of hours with my son.